Shawn Watkins has been assigned to serve as School Resource Officer for the Los Alamitos Unified School District. 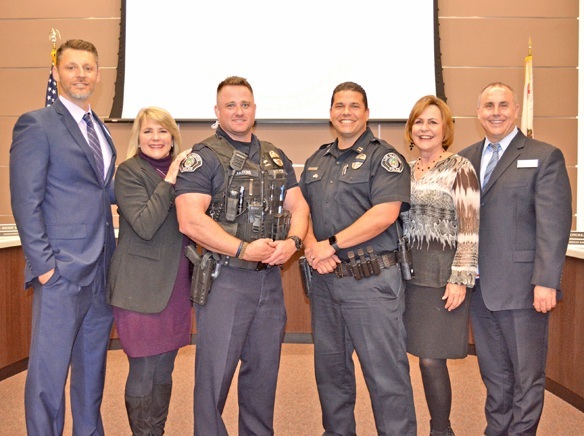 Although he has worked as a patrol officer for Los Alamitos since 2016, Watkins’ position will be funded 45 percent by the city, 30 percent by the school district and 25 percent by Seal Beach. Watkins will serve as a direct liaison between the school district and the Los Alamitos Police Department, participate in Parent Information Nights, serve on the district’s Safety Committee, attend campus activities to provide law enforcement support and conduct presentations to students on various safety-related topics. Before coming to Los Alamitos, Watkins served in the U.S. Army and worked for the Culver City police. In addition to patrol, he has been a Field Training Officer, Firearms Instructor and Homeless Liaison Officer. A graduate of the University of Delaware. Watkins is married with two children and enjoys surfing, golf, jiujitsu and weightlifting.